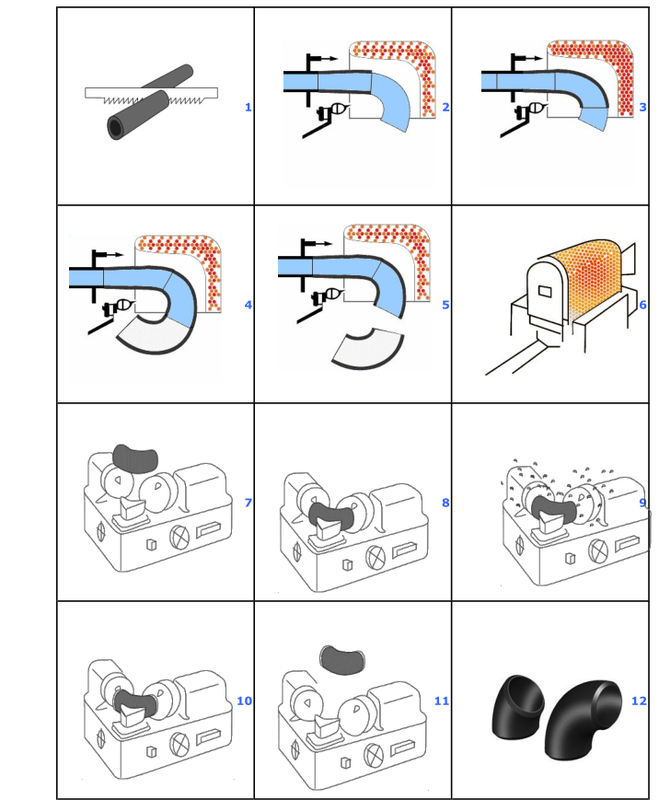 One of the most common manufacturing methods for manufacturing Elbows from pipes. After heating the raw material, it is pushed over a die called "mandrel" which allows the pipe to expand and bend simultaneously. Applicable to a wide size range. Elbows of steel pipe joints are used in the industrial plants and are mainly manufactured by the hot mandrel bending from raw material of straight steel pipe. Elbows are generally manufactured at elevated temperature by means of pushing, expanding and bending of pipes simultaneously, using the inner tool of mandrel. Characteristics of mandrel bending strongly depend on the integrated shape and dimensions of the mandrel. Elbows manufactured by using hot mandrel bending have advantages of small thickness deviation and shorter bending radius than those of any other bending method type.